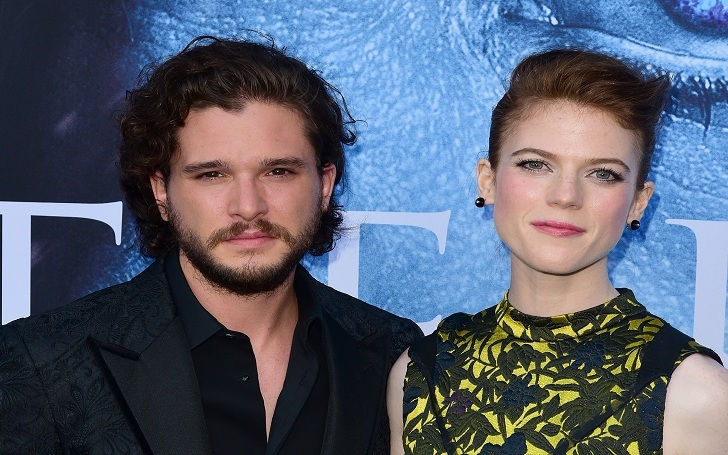 Amid Game of Thrones promotions, Kit Harington seems to have manage time for his girlfriend Rose Leslie. Just a few days ahead of Game of Thrones premiere, the couple was spotted together spending a casual evening in New York City. The duo, who got married in 2018, have remained inseparable since the time they first met. Well, this time Kit accompanied Rose who looked beautiful in a jacket with large pockets and black jeans. She also carried a black handbag and sported a stylish pair of black boots that featured a gold design over the toe. Meanwhile, Kit wore black jeans with a black blazer over his black shirt. The actor donned a clean shaved look that he had shaved off for his recent appearance on SNL on Saturday. Talking about Kit and Rose, the duo began dating in 2012 and had an on-off relationship at the beginning. They got engaged on 27 September 2017 through the "Forthcoming Marriages" section of The Times. They were married on 23 June 2018, at Rayne Parish Church in Aberdeenshire, Scotland. Their wedding reception was organized at the 12th-century Wardhill Castle.